Our new fragrance, Fires in the Night, will debut at this time as well. A complete list of the items which will be restocked is available below the Fires in the Night description. Fires in the Night is the second offering in 'The Night' line. When crafting Edge of the Night, it was clear that it was a fragrance that could stand on its own but also one that would make an incredible darkly sensual foundation for other oils. Used as a base for Fires in the Night, the end result is a sophisticated intensely complex unisex fragrance which contains a total of 31 fragrance and essential oils. Though you can detect Edge of the Night carefully woven into the Fires in the Night blend, Fires in the Night is its own unique spicy, smoky, incensey, glowing fragrance. The Edge of the Night fragrance manifests a deeper, musky, powdery dry down with a green lift and is mildly spicy with no smoke, orange or additional wood notes. After several hours of wear, the two fragrances share a similar character though Fires in the Night maintains a smokier and spicier profile. Use caution if applying this fragrance near cuts or broken skin as the spice oils may sting on individuals with sensitive skin. NOVEMBER REVIEW CONTEST IS STILL ON and the odds are ever in your favor as there have only been a few reviews/entries so far this month! 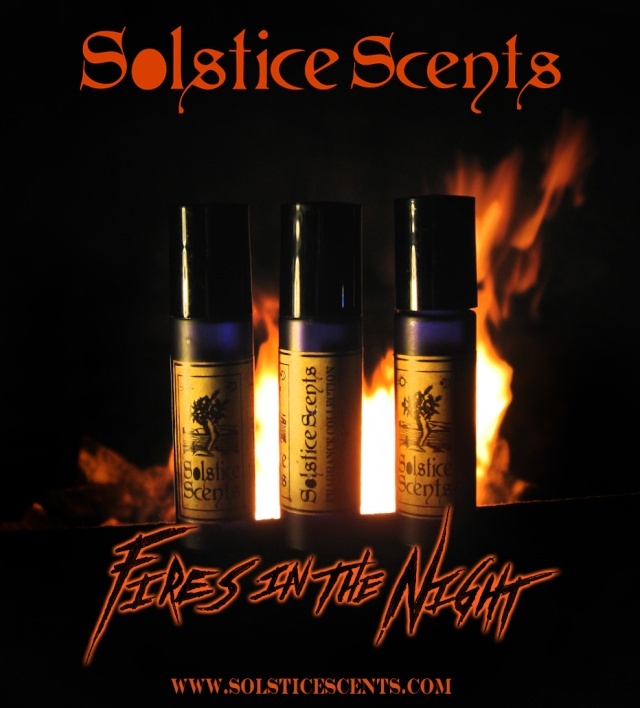 Read the details about the contest here: http://solsticescents.forumotion.com/t587-november-review-contest It's very easy to enter and the prize is 20 points to your Solstice Scents customer account. This is the perfect time to contribute reviews for the Fall, Manor and Foxcroft Collections (or returning Winter Collection fragrances as winter is coming soon!). Really excited for Fires In the Night, but wish it was also released in glace format! Just wanted to add a quick note to say that Fires In the Night is divine! I enjoyed wearing Astral Temple at this time of year and was sad when that scent was discontinued. Fires In the Night shares many of the same notes, but is far better--more complex. Angela, please offer this scent in glace format!